This peak is #59 on the Height List for Alberta . This peak is #95 on the Height List for British Columbia .Eon has a great deal to recommend it as a climb. It's situated in a relatively remote and unvisited area of the Rockies; it's close to Assiniboine and so possesses some of the more spectacular views in the southern part of the range; it is a demanding but not technical ascent; and it has a more dramatic history than most peaks. One will find Eon Mountain on the Mount Assiniboine map (82 J/13) at GR 970321. 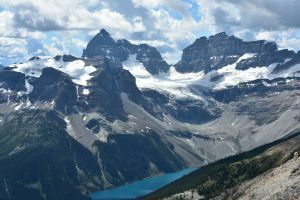 It is part of the continental divide that includes the Assiniboine group (Magog, Assiniboine, Lunette, and Aye) to the N and Gloria, Aurora, and Red Man to the E and S.
Name Notes: According to Boles, et al., the name was likely applied to this peak by Sir James Outram, the early alpinist who first ascended Assiniboine. The name undoubtedly refers both to the apparent age of this peak (and of others nearby) and to the clearly visible bands of horizontal strata, which on many peaks (but not in any really interesting fashion on this one) reveal layer upon layer of fossilized remains from antediluvian times. In effect, such mountains become a museum set-piece that reveals, as one reads the strata from uppermost to lowest, the historical record of the passing of the eons.